Draft: 2005, Colorado Rockies, C1th rd. Chaz's deceivingly grim appearance has earned him some good-natured ribbing by teammates over the years…then-Orioles teammate Zack Britton said he increased their bullpen's intimidation factor "exponentially"…while with Arizona, he was approached by Willie Bloomquist, who said, "A.J. [Pollock] wants to know, but he's too scared to ask you himself. Have you ever been in jail or killed anybody? "… it was the third time Roe had been asked something similar since his call-up...A video clip of Roe's Wiffle-like slider went viral on social media during spring training last year, gaining more than a million views across multiple platforms...Roe's first name came from a former football teammate of his father's named Chaz Czack…his brother's name is Czack (pronounced "Zack")...His father, Donald, played football at the University of Kentucky and once made a solo tackle against running back Herschel Walker… Donald played high school football and baseball against Rays bullpen coach Stan Boroski…once a year, Donald would pull Chaz out of school to go on a fishing trip...His mother, Kelly, describes him as a "mama's boy," saying he texts her often to check in...Chaz grew up a Pittsburgh sports fan…his great uncle is Hall of Famer Bill Mazeroski...His professional career also includes a 2012 detour with the Laredo Lemurs in independent ball…his time in Laredo renewed his love of the game and reminded him to have fun, like he did in high school…the Rays are his 10th major league organization since being selected in the 2005 June Draft...In 2014, Chaz met Michael Jordan at Yankee Stadium and took a photo with him…he was with the Yankees at the time and Jordan was there for one of Derek Jeter's final games...Chaz and his wife, Sarah, have two daughters: Mila (5) and Taylin (3). In his first full major league season, made a career-high 61 apps, 3rd on the club behind Sergio Romo (73) and José Alvarado (70)…was on the 10-day DL, July 7-Aug 13, with a left meniscus tear...His 32 holds tied Alvarado for the AL lead…he and Alvarado tied for 3rd in Rays history, behind Joel Peralta in 2013 (41) and 2012 (37)...Recorded a 1.48 ERA (24.1-IP, 4-ER) and .155 opp avg. (13-for-84) in 30 apps at home, compared to a 5.54 ERA (26-IP, 16-ER) and .234 opp avg. (22-for94) in 31 apps on the road...According to FanGraphs, threw his slider for 52.6 pct. of total pitches, 5th-highest rate in the majors (min. 50 IP)...In the 9th inning on April 30 at DET, went 0.1 IP and allowed a hit and 2 HBP, the first app of his career with 2 HBP…it was the first time in franchise history a pitcher went 0.1 IP or fewer with 2 HBP…was charged 2 runs on a single by Victor Martinez, allowed by José Alvarado…the Rays held on to win, 3-2...On June 9 vs. SEA, inherited 2-on, 2-out in the 8th inning and induced a Jean Segura groundout to end the inning…faced the minimum in the 9th inning, erasing a leadoff single with a 1-4-3 double play for his first career save in the majors, coming in his 132nd app... On June 17 at NYY, recorded his first win since Sep 12, 2016 vs. MIA (with ATL), making 51 apps in between...On July 6 at NYM, yielded a career-high-tying 4 runs (also Aug 28, 2016 at SF, with ATL) on a walk-off grand slam by José Bautista…it was the first grand slam allowed in his career (143rd app)…his 4 runs allowed matched his total from his previous 25 apps combined…was his last app before his stint on the disabled list...On July 13, underwent arthroscopic surgery on his left knee to repair a torn meniscus…The procedure was performed in St. Petersburg by Dr. Koco Eaton. Acquired on July 18 from the Braves for cash considerations…was a September call up for the Rays after making 17 apps with Triple-A Durham... 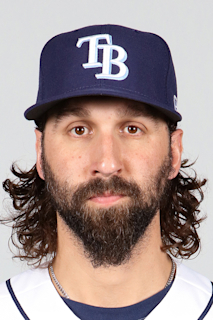 Selected by the Rays from Durham on Sep 5 and became the 53rd and final player used by the club, a club record (52 in 2000)... His only run allowed in 9 apps spanning 8.2 IP with the Rays was a solo homer by Aaron Hicks, Sep 28 at NYY…did not allow a run in his first 7 apps with the team... Held opponents to a .143 avg. (4-for-28) with the Rays... With Atlanta, made his first career Opening Day roster…made 3 apps in April but was on the disabled list for most of the first half with a right lat strain…reinstated from the 60-day DL and designated for assignment on July 6, and outrighted to Triple-A Gwinnett on July 13... After being outrighted by the Braves, allowed 3 R/ER in his only app for Gwinnett…was 0-3 with a 3.00 ERA (21-IP, 7-ER) and 35 SO to 5 BB in 17 apps with Durham. Split the season between Baltimore and Atlanta, while also spending time with the Orioles' Triple-A club in Norfolk...Joined Atlanta on 8/8 after the team claimed him off outright waivers from Baltimore on 8/7...Began the season at Norfolk, going 1-2 with four saves and a 2.39 ERA (10 ER/37.2 IP) in 33 games…Baltimore selected his contract on 6/30... Appeared in nine games with Baltimore, going unscored upon in six of the contests...Designated for assignment on 7/29...Made his Braves debut on 8/9 at MIL, retiring the only batter he faced on two pitches... His fi rst eight appearances with Atlanta were scoreless (8.1 IP), 8/9-8/23…Allowed four runs (8/28 at SF; 0.1 IP) and three runs (9/1 vs. SD; 0.2 IP) in his next two outings...Compiled a 0.47 ERA (1 ER/19.0 IP) in his other 19 outings with Atlanta…Overall 18 of his 21 appearances with Atlanta were scoreless... Went 2.2 scoreless innings on 9/13 vs. MIA, tied for the club's longest scoreless outing by a reliever in 2016... Escaped a no-out, bases-loaded situation in his fi nal appearance of the season, 10/1 vs. DET… Struck out Miguel Cabrera and got J.D. Martinez to ground into a double play to preserve a 5-2 lead…Stranded 16 of 19 inherited runners with Atlanta, while retiring 18 of 21 fi rst batters...Struck out at least one batter in his final 11 appearances (16 total)…The run marks his longest career strikeout streak... Limited right-handed hitters to a .138 (8-for-58) batting average…Among pitchers with as many at-bats against right-handers as Roe, his .138 batting average ranked fi fth lowest in baseball. Held the opposition to a .152 average with runners in scoring position…In these situations with two outs, the opposition hit .056 (1-for-18) against him... Did not allow a hit with the bases loaded (seven plate appearances). Pitched in three games with New York (AL) after being acquired by the Yankees from Miami in exchange for cash considerations on 8/31...Split the season between Triple-A New Orleans (47 games), Triple-A Reno (22 games), and Double-A Mobile (three games)...Led the Zephyrs in appearances and saves (14), finished second in WHIP (1.16), third among the club's relievers in wins (three), and seventh in strikeouts (72)...Posted a 0.63 ERA (1 ER/14.1 IP) over 10 May outings...Allowed three earned runs from 4/16-6/21, posting a 3-1 record with a 0.81 ERA (33.1 IP) and nine saves in that span with New Orleans...Four of his six outs recorded at the Major League level came via strikeout...Was claimed off waivers by Pittsburgh on 9/24. Had contract selected by Arizona on July 1 and made Major League debut that night at the Mets...Allowed one hit and three walks (one intentional), with one strikeout, over 1.2 innings in debut...Allowed one run in each of next three outings through July 30, and was optioned to Triple-A Reno on August 1...Recalled from Aug. 12-17, making one appearance on Aug. 16, and recalled again on Aug. 24 for remainder of season...In 17 appearances from Aug. 16 through end of season, posted 3.57 ERA (17.2 IP/7 ER) and allowed a run in just three appearances...Had 20 strikeouts and seven walks (one intentional) in that time, holding opponents to a .180 (11x61)...Had at least one strikeout in first 11 appearances of season for Reno. Was 5-for-5 in save chances over that span, and saved first six chances overall with Aces...Issued a walk in just three of 22 appearances with Reno (four total)...Held opponents to a .091 (2x22) average with runners in scoring position with Reno. Posted strikeout/walk ratio of 9.9 in 2012 pitching for the Laredo Lemurs in the independent American Association. Opened 2011 in rotation for Triple-A Tacoma in Seattle system...Suffered five losses in 10 starts before move to bullpen for final 23 appearances of season. Spent entire season with Colorado Springs in the Pacific Coast League...Went 9-13 with 5.98 ERA (105 ER, 158.0 IP) in 27 starts...Ranked 2nd in the PCL in losses (13) and 9th in innings pitched (158.0)...Recorded 10 quality starts, including 5 straight June 5-22...went 3-1, 3.19 (13 ER, 36.2IP) in 5 June starts...Allowed 4 hits and 2 runs in CG victory June 5 at Salt Lake (7 K, 3 BB)...Traded to Seattle in exchange for Jose Lopez (inf) on Dec. 2, 2010. Spent the entire season at Double-A Tulsa as a member of the club's starting rotation that nowfeatures fellow Rockies 40-man roster members Jhoulys Chacin, Samuel Deduno and Esmil Rogers...posteda career low 3.15 ERA (117.0 ip, 41 er) in 20 starts for the Drillers...missed the majority of May and halfof June due to injury...opponents hit just .241 (105-for-435) against him, with lefties at .257 (49-for-191) andrighties at .230 (56-for-244)...opponents also hit just .215 (23-for-107) against him with runners in scoringposition...allowed just 7 home runs in his 117.0 innings pitched...posted a lower ERA (2.54) and more wins(5) on the road than at home (4.11 ERA, 2 wins)...allowed 5 runs or more in just 2 of his 20 starts...allowed3 runs or fewer in 15 of his 20 starts...though he issued 3.31 BB/9.0 ip on the season, he issued just onewalk in each of his final four starts to end the season...was named the Rockies 23rd best prospect in theorganization by Baseball America following the season. Began the season in Modesto after spending all of April in extended Spring Training...made just3 starts for the Nuts before being transfered to Tulsa 6/5...went 5-4 with a 4.27 ERA (105.1 ip, 50 er) in 16starts for the Drillers...was named the Texas League Pitcher-of-the-Week for the week of 7/13 due to tossinga complete game 3-hit shutout with 7 strikeouts 7/11 at Arkansas...tossed 6.0 innings or more in 13 ofhis 16 starts with the Drillers...opponents hit .248 (98-for-395) with lefties at .265 (43-for-162) and rightiesat .236 (55-for-233)...rated by Baseball America as the 25th best prospect in the Colorado organization. Made 29 starts for Modesto, the most of any pitcher on the club...his 131 strikeouts and 2 completegames were second-most on the club...was twice named the California League Pitcher of the Week,week ending May 20, and again the week ending August 19...from May 14-20 went 1-1 in 2 starts with a0.60 ERA (15.0 ip, 1 er) with one complete game and 10 strikeouts...from August 13-19 went 2-0 in 2 startswith a 1.84 ERA (14.2 ip, 3 er) with one complete game and 8 strikeouts...finished second on the team,and second in the Cal League with 170.1 innings pitched...along with Brandon Hynick and Alan Johnsonformed a trio of starting pitchers for Modesto that went a combined 35-23 with a 3.26 ERA (189 er/521.1ip) in 83 starts (54 quality starts), with 386 strikeouts compared to 151 walks, all while finishing 1,2,3 in theCalifornia League in innings pitched (Hynick, Roe, Johnson)...following the season was named by BaseballAmerica as the 10th-best prospect in Colorado's farm system. August 14, 2018 Tampa Bay Rays activated RHP Chaz Roe from the 10-day injured list. August 9, 2018 Tampa Bay Rays sent RHP Chaz Roe on a rehab assignment to Charlotte Stone Crabs. July 8, 2018 Tampa Bay Rays placed RHP Chaz Roe on the 10-day disabled list. Left meniscus tear. September 5, 2017 Tampa Bay Rays recalled RHP Chaz Roe from Durham Bulls. August 31, 2017 RHP Chaz Roe assigned to Durham Bulls from Princeton Rays. August 30, 2017 RHP Chaz Roe assigned to Princeton Rays from Durham Bulls. July 18, 2017 Atlanta Braves traded RHP Chaz Roe to Tampa Bay Rays for cash. July 18, 2017 Tampa Bay Rays optioned RHP Chaz Roe to Durham Bulls. July 13, 2017 Atlanta Braves sent RHP Chaz Roe outright to Gwinnett Braves. July 2, 2017 Atlanta Braves sent RHP Chaz Roe on a rehab assignment to Florida Fire Frogs. June 29, 2017 Atlanta Braves sent RHP Chaz Roe on a rehab assignment to GCL Braves. May 20, 2017 Chaz Roe roster status changed by Atlanta Braves. May 6, 2017 Atlanta Braves sent RHP Chaz Roe on a rehab assignment to Florida Fire Frogs. February 16, 2017 Atlanta Braves placed RHP Chaz Roe on the 10-day disabled list. August 7, 2016 Atlanta Braves claimed RHP Chaz Roe off waivers from Baltimore Orioles. July 29, 2016 Baltimore Orioles designated RHP Chaz Roe for assignment. June 30, 2016 Baltimore Orioles selected the contract of RHP Chaz Roe from Norfolk Tides. April 1, 2016 Baltimore Orioles sent RHP Chaz Roe outright to Norfolk Tides. September 1, 2015 Baltimore Orioles activated RHP Chaz Roe from the 15-day disabled list. August 31, 2015 Baltimore Orioles sent RHP Chaz Roe on a rehab assignment to Bowie Baysox. August 10, 2015 Baltimore Orioles placed RHP Chaz Roe on the 15-day disabled list. Right shoulder tendinitis. May 24, 2015 Baltimore Orioles selected the contract of RHP Chaz Roe from Norfolk Tides. December 29, 2014 RHP Chaz Roe assigned to Norfolk Tides. December 15, 2014 Baltimore Orioles signed free agent RHP Chaz Roe to a minor league contract and invited him to spring training. December 2, 2014 RHP Chaz Roe elected free agency. October 2, 2014 Pittsburgh Pirates activated RHP Chaz Roe. September 24, 2014 Pittsburgh Pirates claimed RHP Chaz Roe off waivers from New York Yankees. September 21, 2014 New York Yankees designated RHP Chaz Roe for assignment. September 2, 2014 New York Yankees selected the contract of RHP Chaz Roe from Scranton/Wilkes-Barre RailRiders. August 31, 2014 New Orleans Zephyrs traded RHP Chaz Roe to Scranton/Wilkes-Barre RailRiders. July 20, 2014 New Orleans Zephyrs activated RHP Chaz Roe from the 7-day disabled list. July 6, 2014 New Orleans Zephyrs placed RHP Chaz Roe on the 7-day disabled list. April 1, 2014 RHP Chaz Roe assigned to New Orleans Zephyrs. February 6, 2014 Miami Marlins signed free agent RHP Chaz Roe to a minor league contract and invited him to spring training. February 5, 2014 RHP Chaz Roe elected free agency. January 31, 2014 Texas Rangers sent Chaz Roe outright to Round Rock Express. January 29, 2014 Texas Rangers designated Chaz Roe for assignment. November 1, 2013 Texas Rangers claimed RHP Chaz Roe off waivers from Arizona Diamondbacks. August 24, 2013 Arizona Diamondbacks recalled Chaz Roe from Reno Aces. August 17, 2013 Arizona Diamondbacks optioned Chaz Roe to Reno Aces. August 12, 2013 Arizona Diamondbacks recalled Chaz Roe from Reno Aces. August 1, 2013 Arizona Diamondbacks optioned Chaz Roe to Reno Aces. July 28, 2013 Arizona Diamondbacks recalled Chaz Roe from Reno Aces. July 5, 2013 Arizona Diamondbacks optioned Chaz Roe to Reno Aces. July 1, 2013 Arizona Diamondbacks selected the contract of Chaz Roe from Reno Aces. June 6, 2013 Chaz Roe assigned to Reno Aces from Mobile BayBears. May 28, 2013 Chaz Roe assigned to Mobile BayBears. November 2, 2011 RHP Chaz Roe elected free agency. July 5, 2011 Seattle Mariners sent Chaz Roe outright to Tacoma Rainiers. June 29, 2011 Seattle Mariners designated Chaz Roe for assignment. March 14, 2011 Seattle Mariners optioned RHP Chaz Roe to Tacoma Rainiers. December 2, 2010 Seattle Mariners traded 3B Jose Lopez to Colorado Rockies for RHP Chaz Roe. October 13, 2010 Chaz Roe roster status changed by Colorado Rockies. March 16, 2010 Colorado Rockies optioned Chaz Roe to Colorado Springs Sky Sox. November 20, 2009 Colorado Rockies selected the contract of Chaz Roe from Tulsa Drillers. September 10, 2009 RHP Chaz Roe assigned to Scottsdale Scorpions. June 19, 2009 Chaz Roe roster status changed by Tulsa Drillers. May 27, 2009 Tulsa Drillers placed RHP Chaz Roe on the 7-day disabled list.